New research finds an easy way to help you teach your baby to speak. 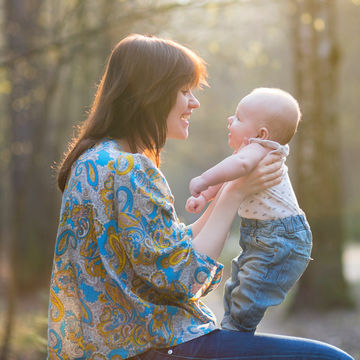 Though you may expect your baby to start talking at about a year, communication starts much earlier, with the first social smile at around 6 weeks. Then comes cooing, that soft sound that's music to new parents' ears, usually between 2 and 4 months of age. Next is babbling. "This starts between 4 and 8 months with the easier consonant sounds combined with vowels, such as 'buh-buh-buh' or 'dee-dee-dee,' " says Julie Masterson, Ph.D., CCC-SLP, a professor of communication sciences and disorders at Missouri State University, and co-author of Beyond Baby Talk: From Sounds to Sentences, a Parent's Complete Guide to Language Development. From there, babies move on to real words (though that doesn't mean you'll be able to understand them!). There is much variability in when this occurs, with some children speaking at 8 months and others not until 14 months. "First words tend to be labels for common people and objects, such as 'dada' or 'ball,' " says Masterson. Engaging your child in conversation is important, says a study published in Infancy. Researchers watched 12 mothers and their eight-month-olds interact twice a month for half an hour over the course of six months. They noticed that babies whose moms responded to their baby talk had more advanced language development than babies whose mothers didn't. The key is trying to understand and engage with your baby, which encourages her to talk to you more (even if it sounds more like babble at first). Chances are, you're probably already doing this. "Parents naturally do most of the things that facilitate language development," Masterson says. "They talk to the baby when feeding her, at playtime and when looking at a picture book together." Playing interactive games, such as patty-cake and peekaboo, can also help, she adds. What doesn't help is pushing. "Anything that feels pressure-filled and unnatural, such as using flash cards, is not going to facilitate language development," Masterson says. "Plus, too many people make the mistake of feeling pressure to get their baby to talk, rather than just relaxing and enjoying watching their baby learn to communicate. "Where you do need to be concerned is if you aren't able to recognize any words by 14 to 16 months, " Masterson adds. "Another red flag is if a child isn't producing clear syllables consisting of consonant and vowel sounds—such as 'da-da-da' or 'ba-ba-ba'—by 11 months." In either case, see your pediatrician or a licensed speech language pathologist.